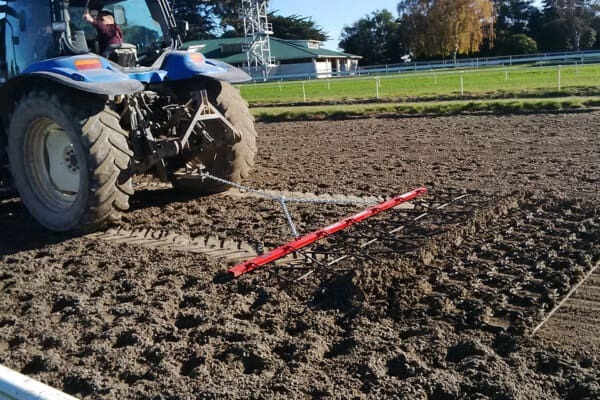 Australia and New Zealand’s favourite grass harrow – The Redback’s Triangle and Chain Harrows are renowned for their multi-faceted benefits to wet and dry pastures all over the world. Ideal for use in general pasture harrowing/aerating, cleaning up after break feeding/ rotation feeding, levelling sand tracks/ arenas and boosting grass growth. Also, a farmers favourite cultivation finishing tool, due to its clod busting and levelling abilities. Aggressive spikes in the front half of this design smash into materials and break it down, while the back half evenly spreads for the ultimate finish. To get started with rejuvenating your pasture, you can enquire below to start a conversation with a specialist in your area, or secure your Redback Harrows online at our special rates by selecting your preferred size, adding to cart and entering your delivery details. The team at Redback look forward to hearing your results. Select a size to proceed with purchase. Had a crack with my new harrows today, wow wat a machine, I used a set of conventional chain harrows last week and thought they did a good job only to find they didn’t compare to the REDBACK harrows. It took a little while to get the speed right but once I did it sent the moss and dead growth flying! I’m really stoaked that I invested in this set, they will integral in rejuvenating our block. Thanks guys keep up the good work! Really happy with your service and I’ll definitely recommend to anyone else. Have harrowed over 100Ha in the last 3 weeks (since purchase) using an ATV and it spread the fresh and dry manure very well. Excellent product that does more than you would expect. It is extremely well made. Want a fast turnaround? No problem. With most popular products held in stock, we can dispatch within 24 hours. We deliver to metro & rural addresses!